The lofty view of man’s progress called ‘history’ deserves a new perspective-that of the common person, not liberated but burdened by modernity. The American anarchist, primitivist philosopher, and author John Zerzan critiques agriculture-based civilization as inherently oppressive and advocates drawing upon the life of hunter-gatherers as an inspiration for what free society should look like. Subjects of his criticism include domestication, language, symbolic thought, and the concept of time. This book includes sixteen essays ranging from the beginning of civilization to today’s general crisis. 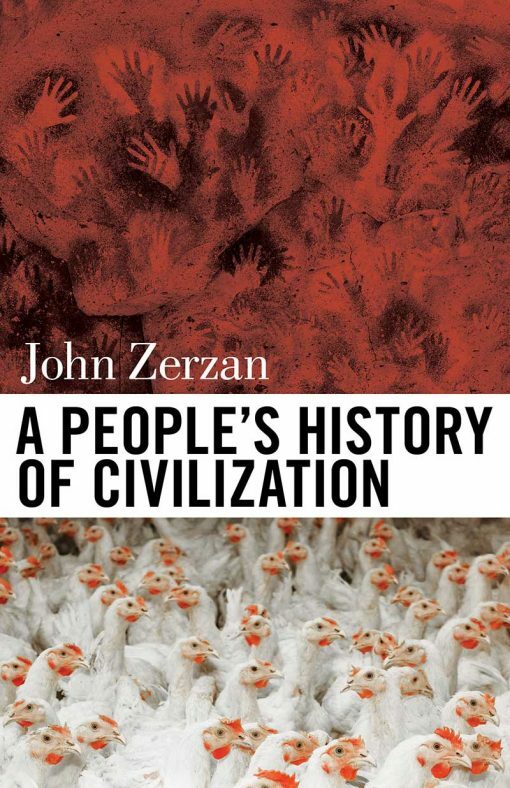 Zerzan provides a critical perspective about civilization. Zerzan’s previous books, Against Civilization, Running on Emptiness, Twilight of the Machines, and Why Hope? explore the complex duality role of man in and against nature. John Zerzan is an American anarchist and primitivist philosopher and author. Zerzan is the editor Black and Green Review,(http://www.blackandgreenreview.org/) a bi-annual compendium of anarcho-primitivist thought. He is also the host of Anarchy Radio in Eugene on the University of Oregon‘s radio station KWVA. He has also served as a contributing editor at Anarchy Magazine and has been published in magazines such as AdBusters. He does extensive speaking tours around the world.